Coach, competitor and now event organiser. For this Mount Buller skier, winter is a full season. A feature at Buller since he was a kid, 21-year-old Watkin McLennan, knows the mountain as well as anyone. When he’s not coaching with the Team Buller riders teambuller.com , Watkin is bombing around the mountain with a core local crew that includes his brother Oscar and Anna Segal. When he’s not skiing, Watkin is studying science and commerce at Melbourne Uni and delivering pizzas to pay the bills. Since I was 3, although i don’t think i got a lot of skiing in, i just trundled around in my mad yellow boots. Did it start as a family thing and has Buller always been your home mountain? It always was a family thing, and still is. My first ski experience was at Mount Buffalo , but we quickly upgraded to Mount Buller, and I’ve been skiing there ever since. Buller breads fun skiers, a few of which include my brother Oscar, Joe Corcoran, Dom Thompson, Nick Breheny, Andre Bennett and everyone from the TBR crew. TBR is the Team Buller Riders – just what is it? 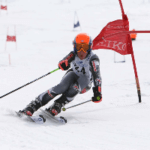 Team Buler Riders is a ski club, focused around any type of skiing that doesn’t involve gates. We get together the best skiers on the mountain and coach youngens how to ski bumps, park and just have a sweet time on the slopes. Buller isn’t renowned for having good weather, so we ski a bit differently, always searching for new skill zones, often in the rain. TBR also hosts competitions, including the longest running mogul comp in Australia, perhaps the world, the ABOM Mogul Challenge , which is celebrating 21 years this season. A new addition to the calendar is the State of Origin, a big air comp to be held September 19th. What is the perfect skiing day for you in Buller? It’s been flaking for days and continues to flake. The ground is covered in powder and the sky is dropping its guts. Buller is full of amazing bowls below the tree line and these stay sheltered, yet the bad weather normally deters most, little do they know! Those are the best days, they’re quiet and there’s no rush to get tracks. to finish up, a few apres drinks at the Whitt on couches that seem to swallow you after a hard day skiing. Does your year involve much time overseas? This season is looking like it will. I’m going to NZ three times: the NZ open, the World Heli Challenge and The Camp thecamp.net is holding a camp in late spring that I’ll be coaching on. In the Northern winter I have been going to the US the past few years. Earlier this year I ran The Camp in Mammoth mammothmountain.com , which is amazing because the park is just so good and the weather always seems to amaze me. After that I spent a short while in Breck breckenridge.snow.com with Johnny Lipzker and Anna Segal. From there I went to Jackson, baby! Sounds like you are going to be busy. I know it’s hard to single out one place, but do you have a favourite OS destination? So far it’s Jackson Hole , but isn’t the idea to keep topping it every year? I have my eyes set on Revelstoke, BC. Do you travel with anyone in particular? 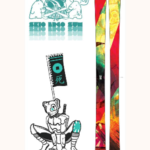 My skis, the Love Guns and Turbo Lovers. You are setting up this new big air event – the State of Origin, what can you tell us about it? 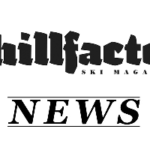 The plan is to get the best NSW skiers down to Mt Buller to battle against the big V. It is a big air, head to head format to be held on the World Cup Aerial site on Chamois. It’s all about having a good time, something that Spring at Buller will have no problem doing, especially when the booze is flowing. This season we are focusing on the skiers and we will give them a time to remember. Do you know who the competitors are from each state? you name it and they’re invited. What are your goals with skiing? Do you see it as a life time pursuit? At the moment I am focusing on some Big Mountain Competitions but in the end the goal is to enjoy it, easily achievable. Of coarse it is a life time pursuit however realistically I can only ski like i am for a short while, so I’m making the most of it.